Suzuki has announced that two-time US 450cc Supercross champion Chad Reed will contest the Monster Energy Cup supercross on Saturday, October 13. 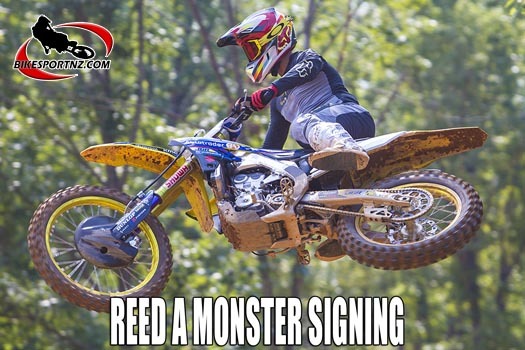 Reed will be racing the Autotrader/ Yoshimura/ Suzuki Factory Racing Team Suzuki RM-Z450 inside Sam Boyd Stadium in fabulous Las Vegas, Nevada, and vying for the $1 million bonus of winning the richest Supercross race in the sport. The event has ﬁlled a void in the American racing off-season for seven years now and has yet to disappoint. The headlining Cup Class features the world’s best racers on a single stage competing for $1 million, but fans also get a chance to see the stars of the future when the Amateur All-Stars, Supermini, and KTM Junior Supercross Challenge riders take to the dirt. Reed is ready and hungry for more supercross success before he also heads Downunder to contest both the Sydney and Auckland rounds of the Monster Energy S-X Open International Supercross FIM Oceania Championships in November. The New Zealand event is set for November 24. Reed contested the Lucas Oil Pro Motocross Championship finale at Ironman Raceway for the team. The 36-year-old holeshot a moto and finished 5-8 for eighth overall and has since spent several weeks testing the RM-Z450 at JGRMX’s Supercross track in North Carolina. The Australian is in great form and very comfortable on the Suzuki RM-Z450. This led to the mutual decision between rider and team to contest the Monster Energy Cup. Fourth on the all-time Supercross wins list, with 44 Main Event victories, Reed is eager to make a statement on the hybrid-style Supercross track. “My experience with the team at the Ironman National was awesome.” Reed reflected. “The race went better than I personally thought it would, because I wasn’t in 100 percent race shape. I achieved my personal goals. Autotrader/ Yoshimura/ Suzuki Factory Racing Team Manager Jeremy Albrecht is excited to continue working with one of the sport’s most decorated athletes.